The process for obtaining a Malaysian Visa has been simplified by the Malaysian government in an effort to boost tourism. Consequently, the government has bought about new regulations, pertaining to electronic Visa (Malaysia eVisa) and Malaysia Visa on Arrival. It has been noted that the more than 6 lakh tourists visited Malaysia in 2017 and this number comes only from the Indian subcontinent. The total visitors to Malaysia increased by 30% in 2018, mostly due to the contribution of simpler visa rules. The type of visa you apply for depends on what your purpose in Malaysia is and how long you will be residing in the country. Single entry Visa: A visa generally issued to tourists and to those who are on a social visit to Malaysia. The single entry Visa has a duration of 3 months which is not extendable. Re-entry into Malaysia is prohibited once the person has departed Malaysia. Multiple entry Visa: A Multiple Entry Visa is issued for those who visit Malaysia for business or diplomatic purposes. The validity of this visa ranges anywhere from 3 to 12 months. You can enter Malaysia multiple times after departure, within the period your visa is valid. The Multiple Entry Visa is available to Indian and Chinese citizens for social visits as well. The duration of this visa is non-extendable. Transit Visa: A transit visa is a permit you require when you have to enter another country via Malaysia. However, this visa is unnecessary if you do not leave airport premises. Last on this list is the Visa on Arrival. A relatively new feature from the Immigration Department of Malaysian and accessible to only select individuals. So what exactly is a Malaysia Visa on Arrival? Visa on Arrival is an entry permit given to a person on arrival into the country. This permit functions the same way a visa does and allows the individual to enter the country. A Malaysia Visa on arrival is the permit you get after entering Malaysia, in order to stay in the country. You have queue up at the immigration counter, pay for the visa and get the stamp of approval on your passport, all after reaching Malaysia. This visa is available to certain nationalities and at certain checkpoints only. Am I eligible for a Malaysia Visa on Arrival? If the above conditions are met you can apply for a Visa on arrival, at a particular checkpoint where Visa on arrival is processed. But at what entry points is the Malaysia Visa on Arrival processed? Once there how do I get a Malaysia Visa on Arrival? Submit proof that you have enough money for sustenance during your stay in Malaysia. You need to have at least 1000 USD with you or a credit card issued by an international bank such as Citi or Amex. Show proof that you hold a return ticket to India. After rigorous checking and validation of all your documents, your Malaysia Visa on Arrival would be approved. What documents do I carry to get Malaysia Visa on arrival? Given below is the list of documents you need to submit to the Immigration counter, to get your Visa on Arrival. But, is getting the Malaysia Visa on Arrival a wise decision? Convenient: Are you are a tourist vacationing in Singapore, whose next destination is Malaysia? Or is Malaysia the next stop on your business trip after Thailand? Then a Visa on Arrival offers convenience and ease, as you need not fill out a form and wait for days to get a separate visa. A Visa on Arrival is your best bet, if you’re planning a short trip to Malaysia after visiting either of the eligible countries. Simplicity: The process to obtain a Malaysia Visa on Arrival is a relatively simple process. If you have a valid visa for Singapore, Thailand or Indonesia then you need just submit the visa processing fee and return ticket proof. You don’t require any extra documents apart from these. Time-saving: If you already hold a visa for Singapore or Indonesia then you can enter Malaysia directly, provided the conditions are met. It saves you a lot of time that would be lost applying for a separate visa for Malaysia. Submitting documents, filling registration form, getting approval for a visa takes a about 2 weeks. This precious time can be saved if you enter Malaysia directly. Higher Cost: A Malaysia Visa on Arrival has a processing fee of 100 USD. In comparison, a normal single entry or multiple entry visa which costs significantly less. Arrival: The Malaysia Visa on Arrival is valid only if you enter from Indonesia, Singapore or Thailand. If you are already vacationing there its convenient, however, if your travel plans do not have either of these countries on your list, then the visa is practically of no use. Sustenance money: It is mandated that if you enter Malaysia with a Visa on Arrival, then you must have a deposit of 1000 USD with you. This is to prove that you have enough to sustain yourself on your tour to Malaysia. The normal visa application has no such rules. You need not carry any minimum amount with you. For an Indian citizen, the best alternative to the Malaysia Visa on Arrival is the eNTRI Visa. The name eNTRI is short for Electronic Travel Registration and Information. It was formulated as a part of the Visa Waiver Program to boost relationships between India and Malaysia. The eNRTI Visa is applicable for Indian and Chinese nationals only. Apply for the eNTRI Visa easily online and at a lesser fee. With an eNTRI Visa, you can stay in Malaysia for 15 days and the visa is valid for a duration of 3 months from the date of issuing. Unlike a Visa on Arrival, that is valid and will allow you to stay in the country only for a week. The eNTRI Visa will be dispatched to you in 48 hours. Whereas, a Visa on arrival presents you with the hassle long queues and cumbersome checks at the immigration counter. A valid visa for Singapore, Thailand or Indonesia is not required. Neither are you obliged to enter the country through specific entry points. If an eNTRI permit is better, how do I get it? 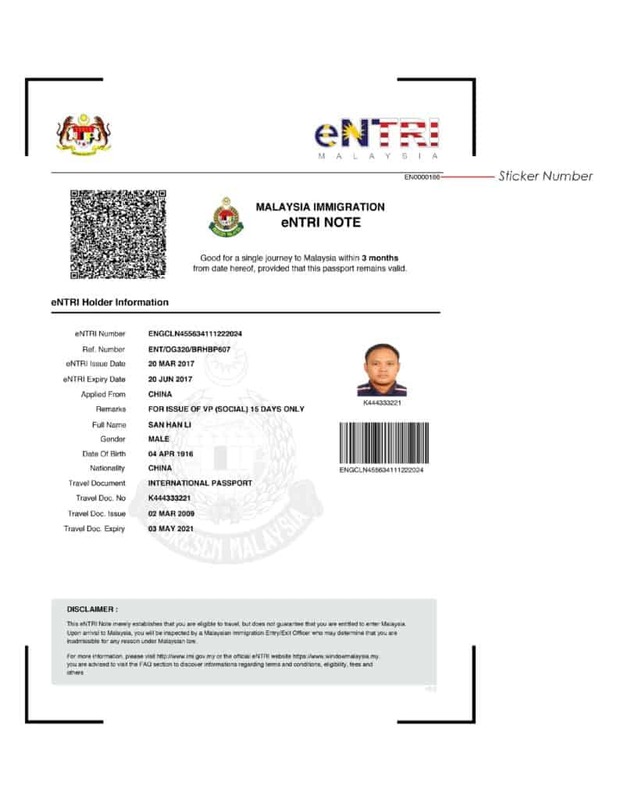 You can apply for an eNTRI permit online at the websites windowmalaysia.my or evisamalaysia.in. Windowmalaysia.my is the official website by the Malaysian government, it is prone to heavy traffic and frequent crashes. The applications made through the official website are also subject to more stringent checks. Therefore, it is recommended that you apply through the website evisamalaysia.in. They are trusted agents and have expertise in securing visas. The website has reliable chat support for any queries you might have and charge a processing fee of only 10%. Firstly, log into the website evisamalaysia.in. Click on ‘Apply for Malaysia eVisa’. Alternatively, you can follow the link given here. Fill in the form with correct information. Upload the documents necessary and pay 10% of the processing fee. You will get the entry visa between 24 – 48 hours. I’m Indian, do I need a visa to visit Malaysia? Yes. Indian citizens need a visa to visit Malaysia. However, you can obtain an eNTRI permit under the Visa Waiver Program. With an eNTRI visa, you can stay in Malaysia for 15 days. You need to pay only 2800 rupees to obtain the eNTRI visa. How do I get a Malaysian tourist visa? You can apply for a Malaysian tourist visa manually through the consulate or the One Stop Centres (OSC) setup by the Malaysian government in different cities in India. The easier course of action would be to apply for an eVisa. You can log into the website evisamalaysia.in to register for an eVisa. The different types of eVisa you can apply for are, single entry, multiple entry and eNTRI visa. Which documents do I need to get an eNTRI Visa? What are the types of Visa for Malaysia? How much do I need to pay for a Visa on Arrival? The cost of processing a Visa on Arrival is 100 USD. In addition to this, you are required to have a minimum of 1000 USD as deposit in your bank. I’m a citizen of India, can I apply for Visa on Arrival for Malaysia? Yes, but only under certain conditions. You can apply for Visa on Arrival if you already have a valid visa for Indonesia, Thailand or Singapore and are entering Malaysia via these countries. Can I work in Malaysia with the Visa on Arrival? No. It is impossible to work in Malaysia with a Visa on Arrival. Can I convert my Visa on Arrival into a tourist or business visa? No. It is impossible to convert the Visa on Arrival into any other type of Visa. The visa validity is for 7 days only and cannot be extended either. How much do I need to pay for an eNTRI Visa for Malaysia? Where can I track my eNTRI Visa application? You can visit the website windowmalaysia.my to track the status of your application. Or you can click on the link given here. If applying through evisamalaysia.in, you will get a call from the agents updating you about your visa status. How soon will I get my eNTRI Visa for Malaysia? The eVisa will take about 48 hours to get approved and dispatched to you. This is excluding weekends and public holidays. There might be slight delays due to unforeseen circumstances, but this is unusual. Do I need to get vaccinated to travel to Malaysia? No. No vaccination for yellow fever or any other disease is required before you travel to Malaysia.